Globalization: it's earlier than you think. 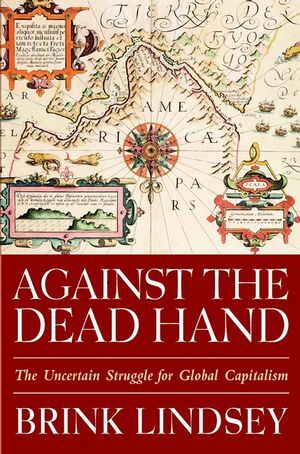 That's the provocative message of Against the Dead Hand, which traces the rise and fall of the century-long dream of central planning and top-down control and its impact on globalization-revealing the extent to which the "dead hand" of the old collectivist dream still shapes the contours of today's world economy. Mixing historical narrative, thought-provoking arguments, and on-the-scene reporting and interviews, Brink Lindsey shows how the economy has grown up amidst the wreckage of the old regime-detailing how that wreckage constrains the present and obscures the future. He conveys a clearer picture of globalization's current state than the current conventional wisdom, providing a framework for anticipating the future direction of the world economy. BRINK LINDSEY is a senior fellow at the Cato Institute in Washington, D.C. He founded and serves as Director of the Center for Trade Policy Studies, a leading voice for free trade and open markets in the Washington trade policy debate. Lindsey's Cato Institute studies have received national and international press attention, and his articles have appeared in The Wall Street Journal, Financial Times, and many other publications. He is a contributing editor of Reason magazine. Lindsey has appeared on CNN, BBC, National Public Radio, and numerous other media outlets. GLOBALISATION is often described as an irresistible new force that, depending on your perspective, will either wreck or save the planet. Brink Lindsey provides an eloquent, much needed corrective by putting international integration into historical context. Mr Lindsey points out that today's period of globalisation has a precursor in the free markets and economic integration of the mid-19th century. That early bout, however, was cruelly interrupted by what Mr Lindsey calls the industrial counter-revolution: an enthusiasm for collectivism, for national economic planning, and, in its most extreme cases, for communist economies. For much of the 20th century, the invisible hand of the market gave way, he writes, to the dead hand of the state. That changed when large parts of the world emerged from communism and statism. But the process is far from finished. With his stories from the Russian steel mills of Magnitogorsk to backyard makers of "boogis" (bare-boned home-made vehicles) in India, Mr Lindsey explains how the effects of state ownership, price controls, trade barriers and other leftovers from the statist era still grossly impede the global economy. Brink Lindsey's Against the Dead Hand: The Uncertain Struggle for Global Capitalism (John Wiley & Sons, 2001) is the most intellectually stimulating of all the recent books on globalization. Lindsey articulates a fervent defense of open markets at the same time he poses serious concerns about their future. Director of the libertarian Cato Institute's Center for Trade Policy Studies, a Washington think tank, Lindsey worries that too many people assume that the continuation of globalization is inevitable. He instead believes that globalization is in its infancy and will be threatened by a series of childhood maladies that could include national and regional financial crises, protectionist backlashes, and antiglobalization political movements. Lindsey recasts the history of trade and commerce over the past 150 years in a highly original way that will intrigue anyone involved in international business. His thesis is that the first great wave of globalization, which lasted until World War I, arose both because of the strength of the intellectual argument in its favor and because of the technological innovations of the Industrial Revolution. But as early as the 1880s, he finds the beginnings of what he calls "the Industrial Counterrevolution." Starting with the writings of Karl Marx and the rise of German state socialism under Otto von Bismarck, the political opposition to free trade and globalization mounted in the late 19th and early 20th centuries, taking the form of protectionism, imperialism, and militarism. It all culminated in World War I, which, Lindsey writes, "provided both the means and motive for the collectivist spasm that followed." In the social and economic chaos that gripped the world from the start of World War I to the end of World War II, the earlier progress toward globalization, writes Lindsey, "was interrupted, its achievements demolished." In his view, the creation of the modern multilateral financial institutions of the international economy in the postwar years, along with the championing of free trade by the United States, slowly recreated the conditions that enable globalization, but it was a long road back. Lindsey notes that world merchandise trade as a percentage of world output has been estimated at 11.9 percent in 1913 - a level of export performance that wasn't matched again until the 1970s. And still, the ideas and movements that produced the Industrial Counterrevolution live on, he says, to distort and frustrate the world's economic development. This is the "dead hand" of his title. Most of the ills commonly blamed on globalization, he argues, are caused by "the continued bulking presence of antimarket policies and institutions" in many of the developing and emerging market countries. The real blame for Russia's problems, for instance, should be placed on such matters as the efforts of its federal and regional governments to prop up moribund industrial enterprises from the Communist era. Such explicit subsidies, the author notes, have been as high as 8 to 10 percent of GDP in recent years. Allover the Third World, protectionism is still strong, with tariff rates averaging 13.3 percent in developing countries, compared with rates of 2.6 percent in the industrialized nations.